Confession: In the past, I’ve been extremely quick to dismiss the value of Second Life in the context of teaching and learning. Even worse, my dismissal was not fact-based … and, if truth be told, I’ve gone out of my way to avoid opportunities to ‘gather the facts’ by attending presentations at conferences, conducting my own research online, speaking with my colleagues, etc. Why not use Nortel web.alive to prepare graduate students for presenting their research? Often feared more than death and taxes, public speaking is an essential aspect of academic research – regardless of the discipline. 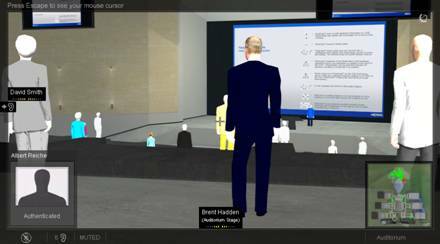 Enter Nortel web.alive with its virtual environment of a large lecture hall – complete with a podium, projection screen for sharing slides, and most importantly an audience! As the manager of Network Operations at York, I’m always keen to encourage novel use of our campus network. The public-speaking use case I’ve described here has the potential to make innovative use of our campus network, regional network (GTAnet), provincial network (ORION), and even national network (CANARIE) that would ultimately allow for global connectivity. Update (November 13, 2009): I just Google’d the title of this article and came up with a few, relevant hits; further research is required. … join us for an exciting national summit on innovation and technology, hosted by ORION and CANARIE, at the Metro Toronto Convention Centre, Nov. 3 and 4, 2008. “Powering Innovation – a National Summit” brings over 55 keynotes, speakers and panelist from across Canada and the US, including best-selling author of Innovation Nation, Dr. John Kao; President/CEO of Intenet2 Dr. Doug Van Houweling; chancellor of the University of California at Berkeley Dr. Robert J. Birgeneau; advanced visualization guru Dr. Chaomei Chen of Philadelphia’s Drexel University; and many more. The President of the Ontario College of Art & Design’s Sara Diamond chairs “A Boom with View”, a session on visualization technologies. Dr. Gail Anderson presents on forensic science research. Other speakers include the host of CBC Radio’s Spark Nora Young; Delvinia Interactive’s Adam Froman and the President and CEO of Zerofootprint, Ron Dembo. This is an excellent opportunity to meet and network with up to 250 researchers, scientists, educators, and technologists from across Ontario and Canada and the international community. Attend sessions on the very latest on e-science; network-enabled platforms, cloud computing, the greening of IT; applications in the “cloud”; innovative visualization technologies; teaching and learning in a web 2.0 universe and more. Don’t miss exhibitors and showcases from holographic 3D imaging, to IP-based television platforms, to advanced networking. For more information, visit http://www.orioncanariesummit.ca. QoS has been on my mind lately. I suppose there are a number of reasons. We’re in the process of re-architecting our data network at York. We’re starting off by adding redundancy in various ways, and anticipate the need to address QoS in preparing for our future deployment of a VoIP service. Of course, that doesn’t mean we don’t already have VoIP or VoIP-like protocols already present on our existing undifferentiated network. In addition to Skype, there are groups that have already embraced videoconferencing solutions that make use of protocols like RTP. And given that there’s already a Top 50 list of Open Source VoIP applications to choose from, I’m sure these aren’t the only examples of VoIP-like applications on our network. At the moment, I have more questions about QoS than answers. When is the right time to introduce QoS? Users are clamoring for QoS ASAP, as it’s often perceived as a panacea – a panacea that often masks the root cause of what really ails them … From a routing and switching perspective, do we wait for tangible signs of congestion, before implementing QoS? I certainly have the impression that others managing Campus as well as regional networks plan to do this. And what about standards? QoS isn’t baked into IPv4, but there are some implementations that promote interoperability between vendors. Should MPLS, used frequently in service providers’ networks, be employed as a vehicle for QoS in the Campus network context? QoS presupposes that use is to be made of an existing network. Completely segmenting networks, i.e., dedicating a network to a VoIP deployment, is also an option. An option that has the potential to bypass the need for QoS. I know that as I dig deeper into the collective brain trust answers, and more questions, will emerge. And even though there are a number of successful deployments of VoIP that can be pointed to, there still seems to be a need to have a deeper discussion on QoS – starting from a strategic level. As I reflect more and more on QoS I’m thinking that a suitably targeted BoF, at CANHEIT 2008 for example, might provide a fertile setting for an honest discussion. The Internet can be improved. IP, its transport protocols (RTP, SIP, TCP and UDP), and especially HTTP, are stifling innovation at the edges – everything (device-oriented) on IP and everything (application-oriented) on the Web. There are a number of initiatives that seek to improve the situation. One of these, with tangible outcomes, is the Stanford Clean Slate Internet Design Program. Researchers and IT organizations need to be reunited. In the 1970s and 1980s, these demographics worked closely together and delivered a number of significant outcomes. Beyond the 1990s, these group remain separate and distinct. This separation has not benefited either group. As the manager of a team focused on operation of a campus network who still manages to conduct a modest amount of research, this takeaway resonates particularly strongly with me. DNSSEC is worth investigating now. DNS is a mission-critical service. It is often, however, an orphaned service in many IT organizations. DNSSEC is comprised of four standards that extend the original concept in security-savvy ways – e.g., they will harden your DNS infrastructure against DNS-targeted attacks. Although production implementation remains a future, the time is now to get involved. The US is lagging behind in the case of broadband. An EDUCAUSE blueprint details the current situation, and offers a prescription for rectifying it. As a Canadian, it is noteworthy that Canada’s progress in this area is exceptional, even though it is regarded as a much-more rural nation than the US. The key to the Canadian success, and a key component of the blueprint’s prescription, is the funding model that shares costs evenly between two levels of government (federal and provincial) as well as the network builder/owner. Provisioning communications infrastructures for emergency situations is a sobering task. 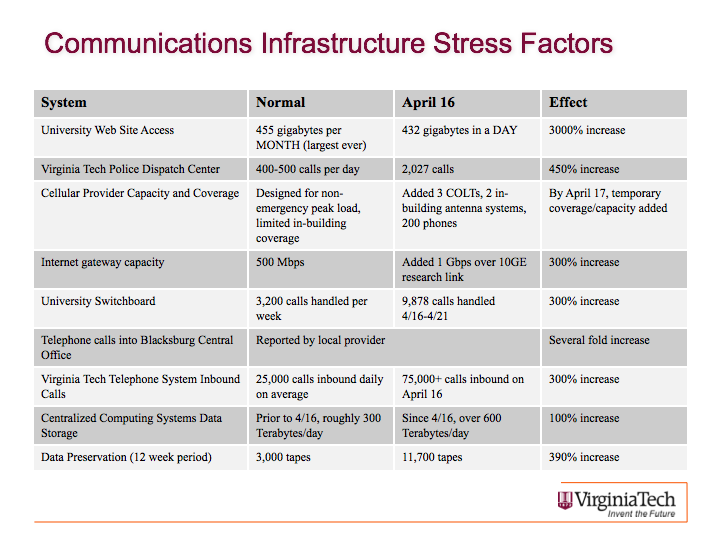 Virginia Tech experienced 100-3000% increases in the demands on their communications infrastructure as a consequence of their April 16, 2007 event. Such stress factors are exceedingly difficult to estimate and account for. In some cases, responding in real time allowed for adequate provisioning through a tremendous amount of collaboration. Mass notification remains a challenge. Today’s and tomorrow’s students are different from yesterday’s. Although this may sound obvious, the details are interesting. Ultimately, this difference derives from the fact that today’s and tomorrow’s students have more intimately integrated technology into their lives from a very young age. Cyberinfrastructure remains a focus. EDUCAUSE has a Campus Cyberinfrastructure Working Group. Some of their deliverables are soon to include a CI digest, plus contributions from their Framing and Information Management Focus Groups. In addition to the working-group session, Don Middleton of NCAR discussed the role of CI in the atmospheric sciences. I was particularly pleased that Middleton made a point of showcasing semantic aspects of virtual observatories such as the Virtual Solar-Terrestrial Observatory (VSTO). 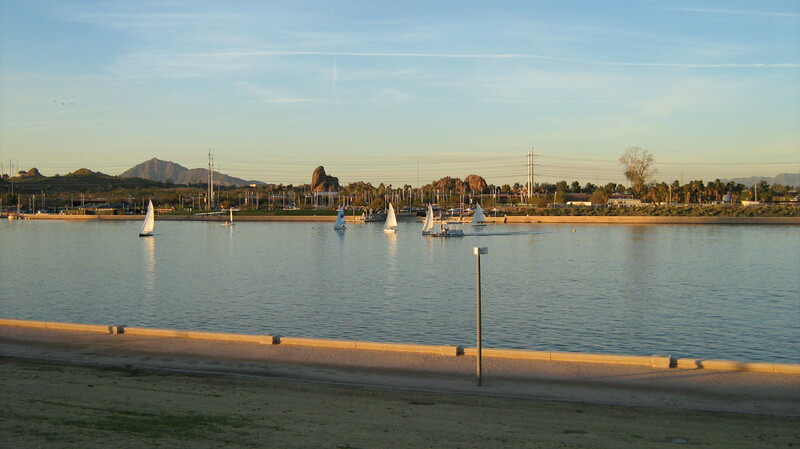 The Tempe Mission Palms Hotel is an outstanding venue for a conference. Net@EDU has themed its annual meetings around this hotel, Tempe, Arizona and the month of February. This strategic choice is delivered in spades by the venue. From individual rooms to conference food and logistics to the mini gym and pool, The Tempe Mission Palms Hotel delivers. If what I’ve been reading over the past few days has any validity to it at all, there will continue to be increasing interest in cyberinfrastructure (CI). Moreover, this interest will come from an increasingly broader demographic. If this definition leaves you wanting, don’t feel too bad, as anyone whom I’ve ever spoken to on the topic feels the same way. What doesn’t help is that the Atkins Report, and others I’ve referred to below, also bandy about terms like e-Science, Grid Computing, Service Oriented Architectures (SOAs), etc. Add to these newer terms such as Cooperative Computing, Network-Enabled Platforms plus Cell Computing and it’s clear that the opportunity for obfuscation is about all that’s being guaranteed. Consensus on the inadequacy of the terminology aside, there is also consensus that this is a very exciting time with very interesting possibilities. So where, pragmatically, does this leave us? The Wikipedia entry for cyberinfrastructure – A great starting point with a number of references that is, of course, constantly updated. The Atkins Report – The NSF’s original CI document. Cyberinfrastructure Vision for 21st Century Discovery – A slightly more concrete update from the NSF as of March 2007. Community-specific content – There is content emerging on the intersection between CI and specific communities, disciplines, etc. These frontiers are helping to better define the transformative aspects and possibilities for CI in a much-more concrete way. Ultimately, however, I believe it’s worth the undertaking at the present time as the possibilities are very exciting. I spent a few days in Ottawa last week participating in CANARIE’s Network-Enabled Platforms Workshop. As the pre-workshop agenda indicated, there’s a fair amount of activity in this area already, and much of it originates from within Canada. Now that the workshop is over, most of the presentations are available online. In my case, I’ve made available a discussion document entitled “Evolving Semantic Frameworks into Network-Enabled Semantic Platforms”. This document is very much a work in progress and feedback is welcome here (as comments to this blog post), to me personally (via email to ian AT yorku DOT ca), or via CANARIE’s wiki. Although a draft of the CANARIE RFP funding opportunity was provided in hard-copy format, there was no soft-copy version made available. If this is of interest, I’d suggest you keep checking the CANARIE site.